Merry Christmas and Happy Holidays from Mayhem in Paper! 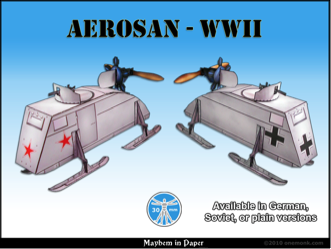 This free WW2 Aerosan is in 30mm scale and comes with both German and Soviet markings. Have fun! when I get tired of looking at buildings and need a break, I'd like to see about doing a steampunk/clockwork modification for these!